This device stands out by the combination of a pulse oximeter and a separate usable (removable from the monitor) BIOSCOPE-D. Pulse oximeter and BIOSCOPE-D are united to a small compact monitor. The monitor could be used as a desktop model or fastened at an infusion stand by a tripod mount. The anaesthesia monitor BIO-3A is suitable both for mains and battery operation. It also has built-in rechargeable batteries besides an external power supply. The operation time with fully loaded batteries is about eight hours. The batteries will be loaded with the monitors built-in charger. On the one hand the BIO-3A could be used in an uninterrupted mains operation mode at a permanent location, on the other hand a mobile use is also possible. The monitor BIO-3 is not developed for bed-sided use. It is suitable for operations while medical specialist staff is in the proximity and can directly react to a triggered alarm. 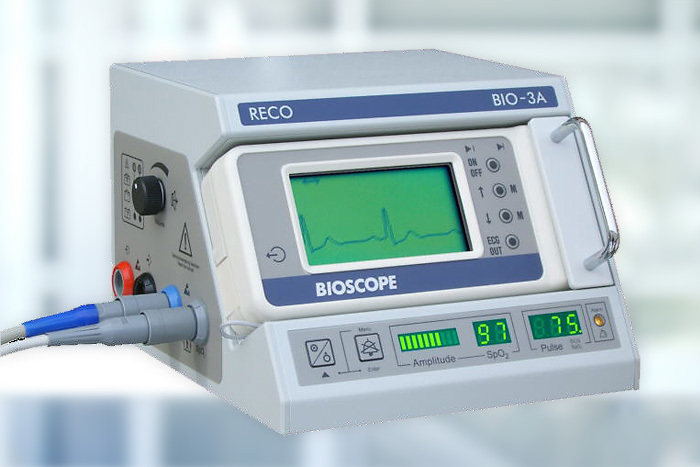 The optional available PC software BIO-3A is the perfect tool to document the data derived from the anaesthesia monitor BIO-3A. So you can see the signals of ECG and plethysmogramm on a larger screen of a PC and watch the trend of heart rate and SpO2 in real time. Certainly it is possible to store the transmitted data for a later processing. The software has a built-in printing function for your documentation. Also is a data export possible. Please send an email to sales@recomedical.com to ask for pricing. Currently not available! The service for BIO-3A is continued. Modifications reserved.